Today the sun is blank. There are no sunspots. Meanwhile a stealth CME is heading for Earth now and could unsettle Earth’s polar magnetic field on May 10th. 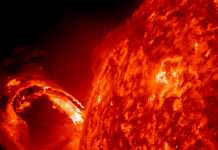 When the sun blasts a coronal mass ejection (CME) into space, the event is usually announced by the bright flash of a solar flare or the collapse of a towering magnetic filament. But sometimes CMEs slowly materialize on their own without an instigating explosion. 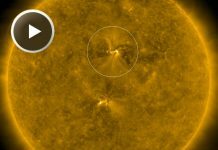 These are called “stealth CMEs,” and one of them is heading for Earth now. A relatively gentle blow from the slow-moving storm cloud could unsettle Earth’s polar magnetic field on May 10th. Today, May 10, 2017, the sun is blank… There are no sunspots at its surface. This is the 31st day in 2017 that the sun has been without spots. Yes an ENTIRE MONTH. For comparison, the sun was blank on 32 days in the whole of 2016. Solar Minimum is yin to the yang of Solar Maximum, a natural part of the sun’s ~11 year sunspot cycle. Solar Minimum brings a time of enhanced cosmic rays, pink auroras, a collapsing ionosphere and accumulating space junk. 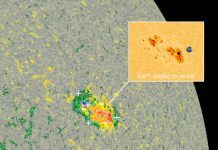 The accelerating pace of spotless suns is a sign that Solar Minimum is approaching. Crazy… It looks like Sun would be dead. And like Earth would be dying with this cold weather. One of my friend tells me she feels like being settled in some ice-stone mental prison or on the stone-ice desert. Biblical Great Tribulation maybe?